Sisters of Mercy – direct affiliation with school ended in 1993 with departure of Sr Judy Breen (long term member of staff, former principal and REC). The Catholic Schools inspected by the Commissioners in 1856 were staffed by laymen and laywomen; there was no school taught by nuns or brothers. The deficiencies revealed in that inspection made it necessary to improve teaching in Church schools as well as in the National schools. The government threw the whole responsibility for Catholic schools upon the Bishops. 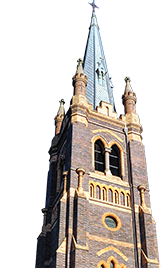 St Philomena’s Convent School, the second oldest school in Moree was founded in 1898 when Sisters of Mercy came from their Mother House in Gunnedah to establish a Convent and a School. Mother Aloysius and five sisters arrived in Moree on April 18, 1898. Father McGuinness and the Church Committee built a schoolroom on the southern side of St Henry’s (the weatherboard church built in 1884). When the new brick church of St John and St Henry was opened in 1930, the old church of St Henry was converted to school use. Until 1912 the main objective of the nuns was to concentrate on primary education. Then when a new program of secondary education was introduced by the Department of Education children were prepared for the Intermediate Certificate Examination. Music, Commercial Subjects, Art of Speech and Needlework were included in the curriculum. In 1967 this Secondary department was closed because of staffing difficulties and the requirements of the new Wyndham scheme. Since that date St Philomena’s has concentrated on its Primary school. With the additional space available from the Secondary section, the school in East Moree was closed and all students were housed in West Moree. For a time the East Moree school building was used by the Technical College. In 1965 a new Primary Block costing $180,000 had been opened and blessed by Bishop Doody. It contained eight classrooms, offices, storerooms, toilet blocks and a large assembly area. A second brick building was erected in 1970 for the Infants’ Department. It contains four classrooms and an assembly area beneath. It was in 1970 that St Xavier’s School, East Moree, was closed and all Catholic children were accommodated at St Philomena’s. On the night of 4th February, 1972 a fire destroyed an old building (formerly the Presbytery) that had been used for classes. The fire spread to the roof of the Primary building, the total damage being estimated at $48,000. The Sisters had to bring back into use the old buildings in East Moree as well as part of the old Boarders’ Section of the Convent built in 1902. The situation has speedily been restored with the repair of the damaged building and the purchase from the Department of Education of a classroom block from the Wirahirai School closed at the end of 1971. From the erection of the Convent in 1902 the Sisters provided accommodation for boarders. St Philomena’s was affected by improved communications just was the MA and closed its section for boarders in 1968, two years after the closure of the MA Hostel for girls. The nuns provided cultural and commercial subjects for other children and adults as well as for their own pupils. A large number of Moree people gained examination success under teachers a the Convent. The disappearance of the small private school after 1900 is probably due to the opening of the Convent at about that date.